Enjoy Bavarian Breads Whole Grain Gluten Free. We Sell Some Of The Best-Tasting, Gluten Free Whole Grain Bread On The Market. 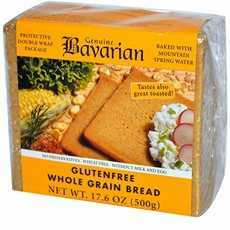 Our Gluten Free Whole Grain Bread Is Genuine Bavarian Brand, And Made With A Long List Of Nutritious Ingredients. (Note: Description is informational only. Please refer to ingredients label on product prior to use and address any health questions to your Health Professional prior to use.